Good Words from Happy Customers! This summer, the Lice Treatment Center really came through for my family. My husband and I are going through a divorce, and as he put our 12-year-old daughter on a plane after a visit with him, he sent me an awful text: "I think she may have lice." It was an understatement, since she had full grown lice with wings flying off her head. 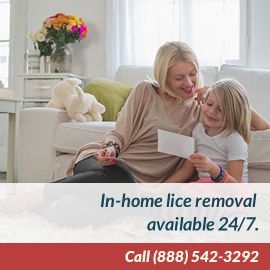 I had used the Lice Treatment Center a few years before when the same daughter, who has thick, curly blonde hair, got lice during a sleepover. They had sent a technician to my home in Washington, DC within hours. But now I was worried: could they send someone to me at the beach, hours from any major city? They came through. The best words I think I've ever heard were Liz Solovay telling me, "We'll have someone on the bus to you tomorrow morning." The technician had to stay for 12 hours to rid me and my two daughters of lice. But she got the job done and even came back a week later for a recheck. Almost every parent has a terrible lice story. Or two or three. But mine have happy endings thanks to the Lice Treatment Center! How many ways can you say thank you? 100s. I am so grateful for you sending Danielle to our home to heal my daughter. She was pleasant, courteous, kind, professional and must say after years of being in customer service there are those that do there job and those that care about what they do. She truly cares. I cannot express my sincere gratitude and I hope she receives a award for outstanding customer service. The hospital was rude and indifferent and my wife tried for 24 hours to fix this issue. $700.00 is a lot of money for a family like us, but having Danielle in my home made it all worth it. If you ever would like a customer referral, please give them my name and phone number 5 star rating and the best of the best. Danielle is in the top 1 percent. I sincerely thank you. And I hope she gets rewarded for her time, demeanor and knowledge. We called the Lice Treatment Center on the eve of a family vacation in a panic. Liz had a technician at our house within two hours. And the technician stayed with us until everyone in the house had been treated. It was a crazy night but through it all, while we were in a panic, Liz was calm and soothing. And then the lice was gone. So thank you so much for treating us with professional aplomb. We will recommend you again and again. Liz, I want to tell you how very much I appreciate you and Tricia, and all your thoughtfulness. This problem was horrible, and you ladies helped me and my family and were so wonderfully kind and went out of your way to do so. I will always be grateful and recommend your products and services, to everyone I know. Lice had gotten to be such an issue in our lower school that we decided to have The Lice Treatment Center come in and do periodic "head checks" on all of our students. LTC's technicians set up in our school gym and checked every student's head quickly and with a minimum disruption to our school day. What really impressed me is how kind the technicians were to the kids--especially the ones who did have head lice. We've had the problem under control since starting with LTC. Hi Liz. I just wanted to say thank you for having Denise come to my house last night. I don't think I have ever been so happy to see anyone in my entire life. She was great with the girls. Very patient and thorough. And very knowledgeable. I could not have overcome this problem by myself. I am very grateful for your help and will sing your praises to anyone who'll listen. I gave your information to the school nurse for other parents...she had never heard of your services. I also went to Walgreen's today and bought quite a bit or your product. Being green and not having my girls exposed to toxic chemicals is extremely important to me. I only will use organic or all natural products for their personal care. So that was a bonus for us that the ingredients aren't pesticides..but natural, non-toxic ingredients. I will be using them on myself as well. I even bought the bed bug spray for my husband since he travels a lot for business. So thank you for your help with this horrific problem. To start, thank you so much for switching your schedule and responding to my call so quickly yesterday. I really appreciate it. It made a distressing situation so much more bearable. To give you some background, our school has a lice epidemic. This has been a non stop event since the fall. Thanks to (another mother), I was informed of your company. They were extremely professional and put me (a critter phobic) at ease. We had been struggling with head lice for several weeks. After two rounds of Nix shampoos and Cetaphil treatments, and many hours of nit picking, I was still seeing recurring nits in my daughter's hair. I called LTC and spoke to Liz, who immediately reassured me that she would have a technician to our family right away. And a technician did arrive that evening, after sitting in hours and hours of traffic on 95. Nonetheless, she arrived at our house in good spirits and got to work right away. She worked non-stop for three hours. She was friendly and very professional; she gave all four heads in the family a thorough check and treatment. She has put my mind at ease. We are following the treatment that she outlined; and we are all very hopeful that this will be the last of the head bugs! Many thanks from a mom in Connecticut!